I can’t take credit for this old Gourmet recipe, but can attest to its goodness. Chockfull of winter vegetables and delicious bacon, this winter salad is comforting and nutritious. An egg adds a little protein. If you’ve never tried lentils, I urge you to do so – they’re inexpensive, store well and cook quickly. A few notes: if you have no patience for chopping, use a food processor to prep the vegetables. Omit the bacon and cook the vegetables in butter to make vegetarian. Serves 4. 1. Place lentils in a pan and cover with 2 inches of water. Leave pan uncovered and bring to simmer. 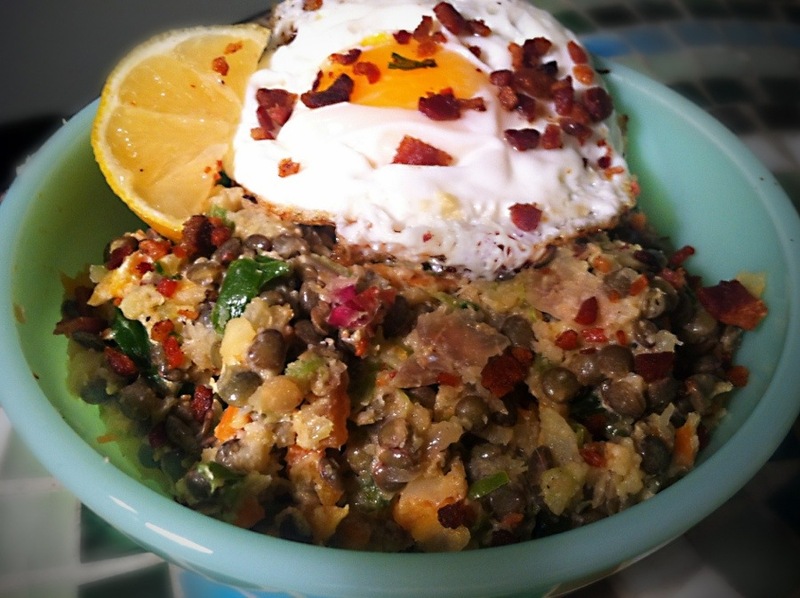 Cook lentils til just tender – about 20 minutes. 2. While lentils are simmering, cook bacon in a large skillet over medium heat until crisp. Drain on paper towels, leaving rendered fat in skillet. 3. To the same skillet, add vegetables and season with salt and pepper. Sauté until just tender – about 7 – 10 minutes. 4. Add lemon juice to vegetables and let liquid evaporate. Remove skillet from heat and stir in half the bacon. Transfer to a large bowl. 5. When lentils are done, drain, then toss with vegetables and season to taste. Stir in Parmesan, and keep warm. 6. Drain the skillet, then add olive oil and heat over medium-high heat. Fry eggs until whites are just set but yolks are still runny. Season with salt and pepper. 7. Divide lentil salad among 4 plates. Top with eggs and remaining bacon and sprinkle with Parmesan.